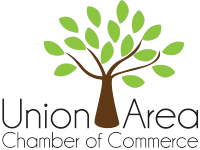 Thank you for your interest in the Union Chamber of Commerce! Please complete the following member information. Get ready to laugh so hard your sides and cheeks hurt at the 17th Annual Valentines Dinner & Comedy Show on Saturday, February 9, 2019. Doors and cash bar open at 6:00 PM. Dinner served at 6:30 PM. NO OUTSIDE BEVERAGES ALLOWED! The 2-hour comedy show will start at 8:00 PM. Dance will start after the show until 1:00 AM. Comedian Kevin Patterson (http://www.kpcomedian.com/) will start the show, Jerry Donovan (http://www.jerrydonovan.com/) will follow and then show will finish with Headliner Dr. Gonzo (https://www.facebook.com/drgonzocomedy/). Tickets: $40.00 per person and includes romantic dinner, 2-hour comedy show, cash bar, rose (for the ladies) & dance! TICKETS NOW ON SALE, SO DON'T DELAY AND PURCHASE TODAY! Purchase tickets at UPRD, located in the lower level in City Hall at 500 E. Locust St.
For more information, call UPRD at 636-583-8471. Doors and cash bar open at 6:00 PM. Dinner served at 6:30 PM.